No trip to Greece would be complete without a sampling of Ouzo, the anise-flavored spirit widely consumed in Greece and Cyprus. Personally, I despise Ouzo and anything else liquorish or anise flavoured but drinking ouzo in Greece is nothing short of an obligation. Ouzo, much like Greece itself, has a long history. Its precursor is tsipouro, a drink distilled throughout the Byzantine Empire and continued throughout Ottoman times. One version of tsipouro was flavoured with Anise that eventually came to be called Ouzo. Modern ouzo production took off in the 19th century centered on the island of Lesbos. Lesbians (inhabitants of Lesbos Island) claim to be the originators of the drink and the island remains a major producer. In 2006, Greece won the right to label ouzo as an exclusively Greek product, meaning, it isn't made in Greece, it's not ouzo. Ouzo is made by distilling 96% pure ethyl alcohol in copper stills together with anise and optional other flavorings. The resulting product is known commonly as ouzo yeast—μαγιά ούζου in Greek—a misnomer, as no fermentation has taken or will take place. Ouzo yeast is then usually mixed with 96 percent alcohol, and finally sugar may be added and the mix is diluted, with water, to usually around 40 percent ABV. Ouzo is typically mixed with water, which produces an interesting effect. 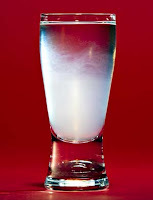 When water or ice is added to ouzo, it turns a cloudy milky white; this is because anethole, the oil of anise, is soluble in alcohol but not in water. Diluting the spirit causes it to separate creating an emulsion, whose fine droplets scatter the light. Ouzo can also be drunk, straight, from a shot glass. Mixing ouzo with cola destroys the liquorice-like taste of ouzo (which some may consider a good thing).